The Maremma Sheepdog, is a breed of livestock guardian dog that originated in central Italy and has been used for centuries by Italian shepherds to guard sheep from wolves. The breed's English name derives from the Maremma section of Tuscany where British and American breeders first saw the dog and mistakenly believed the dog originated. The breed is widely employed in Abruzzo where sheep herding remains vital to the rural economy and the wolf remains an active and protected predator. 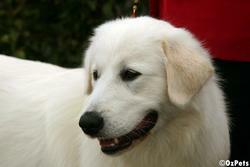 The breed resembles the Pyrenean Mountain Dog, the Kuvasz of Hungary, and the Akbash Dog of Turkey. The Maremma has a solid, muscular build, thick white coat, large head, black nose,it has a bear like face and typically weighing between 65 to 110 pounds (30-50 kg) and standing from 23 to 29 inches tall (60-75 cm) -- though some dogs grow to even more massive proportions. As far as coloring goes they can have tints of yellows and cream. His principal function as a guard and defence dog of flocks and property in general, shows itself in the manner in which he accomplishes these tasks, with perception, courage and decision. 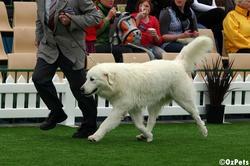 Despite their large size, Maremma can be good companion dogs in areas with adequate open space. Centuries of breeding the dogs to be gentle with lambs but fiercely protective of their flock has created a breed that will bond to families and show a calm, intelligent disposition. However, the dogs may display hostility towards outsiders and they are not suitable companion dogs for urban areas due to their large size and need for open space. In addition, Maremmas do not tolerate heat well, and thus climate must be considered. Sheepdog of the Abruzzes circa 1915. 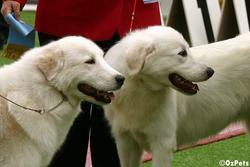 Descriptions of sheepdogs similar to current Maremma can be found in ancient Roman literature. The dogs are also depicted in 15th century paintings. The dogs (whose official Italian breed name is "pastore maremmano-abruzzese" but who are more often called "pastore abruzzese" omitting reference to the breed's English name) are believed to have originated in the Apennine mountains of Abruzzo two thousand years ago where early shepherds used the dogs to drive off wolves. As sheep farming developed into an annual trek or transhumance from mountain grasslands of Abruzzo and Molise (and other parts of central Italy) south to lower pasture land in Apulia where sheep were over-wintered, the dogs came to play a central role in the centuries-old migration, an annual event vital to Abruzzese culture. While the Italian Transhumance ended in the 1860s, the dogs continue to be widely used by Italian sheep farmers in areas where predation is common, especially in the open range land of Italy's national parks in Abruzzo. Ironically, working Maremma are today a rarity in the Maremma section of Tuscany where sheep farming has declined and the wolf is nearly extinct. Besides their wide use in Italy, Maremma are extensively used as Livestock guardian dogs (LGDs) in New Zealand, Australia, the United States, and Canada. Maremma used as Livestock Guardian Dogs are introduced to sheep flocks as puppies so they bond to the sheep. Some ranchers place Maremma puppies as young as 3-4 weeks old with young lambs though beginning this bonding process at 7-8 weeks is more typical. Although it is easiest to bond Maremma to sheep and goats, cattle ranchers have found that the dogs will bond with cows and Maremma are increasingly used to protect range cattle. Recently in Warrnambool, Australia, the world's first trial utilized a Maremma to guard the dwindling penguin population of Middle Island. While using Maremma to guard an endangered species is rare, Maremma along with other breeds of livestock guarding dogs are appreciated by environmentalists because they make it possible for livestock to coexist with endangered predators such as wolves and coyotes, reducing their predation by 70% to 80% or more. National park authorities in Italy, the United States and Canada have promoted use of the Maremma Sheepdog, as well as other types of LGDs, to minimize conflict between endangered predator species and ranchers.